So here I was, having just read “Swamplandia!” but with no idea how to turn a girlfriends’ getaway to southwest Florida into our own gator adventure. A friend who’s spent most of her life in the Miami area had a suggestion. “Book a tour with Captain Bob’s Excellent Adventures,” she said. “They’ll take you on an airboat ride through a swamp filled with all kinds of wildlife.” So that’s what Mom, Sis and I did. We caught the shuttle bus in Estero. Tour guide Pete entertained us regally on the half-hour ride to Corkscrew Swamp Sanctuary near the little town of Immokalee. He talked about the elusive and endangered Florida panther. He pointed out acre upon acre of orange orchards. He spoke knowledgeably about the Seminole Indians. He suggested that we read the 1947 masterpiece “River of Grass” by Marjory Stoneman Douglas if we really wanted to learn about the history and ecology of the Everglades. When we arrived at a ramshackle little boat dock called “Airboats and Alligators,” Pete turned us over to boat pilot Tony. “If you’ve got coats, put ‘em on,” Tony told the dozen or so brave souls who’d be heading out into the swamp with him. “It’s chilly this morning.” He was right. It was 47 degrees and overcast, with a stiff wind blowing. I’d brought only summer clothes—flip-flops, lightweight shirts and britches and a wide-brimmed sun hat—to Florida. The one coat I’d packed was a flimsy rain jacket. I pulled it on and zipped it all the way up to my chin. The ride was chilly indeed, especially when Tony punched the boat up to full speed. He stopped several times to point out birds—thousands of them, in countless varieties—many not found in Tennessee. Anhinga. Egret. Ibis. Moorhen. Wood stork. Osprey. 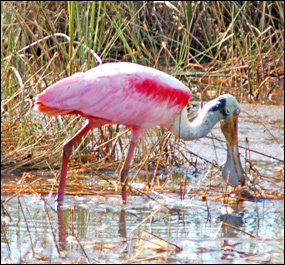 And my favorite of all—the gorgeous roseate spoonbill. But we came across only two gators, both puny and absolutely unwilling to let us get a good look at them. Tony explained that alligators like to bask in the warm sun. Since the weather was cool and cloudy, the gators were staying warm and out of sight in the muddy swamp bottom. It was all I could do not to cry. “I’m not just disappointed,” I told Tony as we headed back to the dock. “I’m heartbroken.” He spit a stream of tobacco juice into a Mountain Dew bottle and shrugged. There was some small consolation in the reptile show that followed the boat ride. Pete brought out all kinds of critters for us to look out and touch, if we wanted to. I held a box turtle (no points for bravery), a very cool looking king snake and a hefty python that made me so nervous as he curled around my shoulders that I had to insist that Pete TAKE IT OFF ME RIGHT NOW. Starring in the grand finale was, thank goodness, a baby alligator. He was two years old, two feet long and adorable. I had my picture taken holding him, so the day wasn’t an entire wash. But it wasn’t exactly what I had in mind when I planned this grand adventure. Would I have to go back to Tennessee without experiencing a real gator encounter? Tune in next week to find out.